SQLAlchemy is a database toolkit and object-relational mapping (ORM) system for the Python programming language, first introduced in 2005. From the beginning, it has sought to provide an end-to-end system for working with relational databases in Python, using the Python Database API (DBAPI) for database interactivity. Even in its earliest releases, SQLAlchemy's capabilities attracted a lot of attention. Key features include a great deal of fluency in dealing with complex SQL queries and object mappings, as well as an implementation of the "unit of work" pattern, which provides for a highly automated system of persisting data to a database. Starting from a small, roughly implemented concept, SQLAlchemy quickly progressed through a series of transformations and reworkings, turning over new iterations of its internal architectures as well as its public API as the userbase continued to grow. By the time version 0.5 was introduced in January of 2009, SQLAlchemy had begun to assume a stable form that was already proving itself in a wide variety of production deployments. Throughout 0.6 (April, 2010) and 0.7 (May, 2011), architectural and API enhancements continued the process of producing the most efficient and stable library possible. As of this writing, SQLAlchemy is used by a large number of organizations in a variety of fields, and is considered by many to be the de facto standard for working with relational databases in Python. The term "database abstraction" is often assumed to mean a system of database communication which conceals the majority of details of how data is stored and queried. The term is sometimes taken to the extreme, in that such a system should not only conceal the specifics of the relational database in use, but also the details of the relational structures themselves and even whether or not the underlying storage is relational. The most common critiques of ORMs center on the assumption that this is the primary purpose of such a tool—to "hide" the usage of a relational database, taking over the task of constructing an interaction with the database and reducing it to an implementation detail. Central to this approach of concealment is that the ability to design and query relational structures is taken away from the developer and instead handled by an opaque library. Those who work heavily with relational databases know that this approach is entirely impractical. Relational structures and SQL queries are vastly functional, and comprise the core of an application's design. How these structures should be designed, organized, and manipulated in queries varies not just on what data is desired, but also on the structure of information. If this utility is concealed, there's little point in using a relational database in the first place. The issue of reconciling applications that seek concealment of an underlying relational database with the fact that relational databases require great specificity is often referred to as the "object-relational impedance mismatch" problem. SQLAlchemy takes a somewhat novel approach to this problem. SQLAlchemy takes the position that the developer must be willing to consider the relational form of his or her data. A system which pre-determines and conceals schema and query design decisions marginalizes the usefulness of using a relational database, leading to all of the classic problems of impedance mismatch. At the same time, the implementation of these decisions can and should be executed through high-level patterns as much as possible. Relating an object model to a schema and persisting it via SQL queries is a highly repetitive task. Allowing tools to automate these tasks allows the development of an application that's more succinct, capable, and efficient, and can be created in a fraction of the time it would take to develop these operations manually. To this end, SQLAlchemy refers to itself as a toolkit, to emphasize the role of the developer as the designer/builder of all relational structures and linkages between those structures and the application, not as a passive consumer of decisions made by a library. By exposing relational concepts, SQLAlchemy embraces the idea of "leaky abstraction", encouraging the developer to tailor a custom, yet fully automated, interaction layer between the application and the relational database. SQLAlchemy's innovation is the extent to which it allows a high degree of automation with little to no sacrifice in control over the relational database. Central to SQLAlchemy's goal of providing a toolkit approach is that it exposes every layer of database interaction as a rich API, dividing the task into two main categories known as Core and ORM. The Core includes Python Database API (DBAPI) interaction, rendering of textual SQL statements understood by the database, and schema management. These features are all presented as public APIs. The ORM, or object-relational mapper, is then a specific library built on top of the Core. The ORM provided with SQLAlchemy is only one of any number of possible object abstraction layers that could be built upon the Core, and many developers and organizations build their applications on top of the Core directly. The Core/ORM separation has always been SQLAlchemy's most defining feature, and it has both pros and cons. 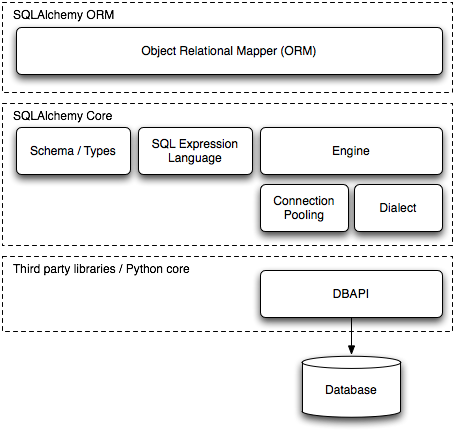 The explicit Core present in SQLAlchemy leads the ORM to relate database-mapped class attributes to a structure known as a Table, rather than directly to their string column names as expressed in the database; to produce a SELECT query using a structure called select, rather than piecing together object attributes directly into a string statement; and to receive result rows through a facade called ResultProxy, which transparently maps the select to each result row, rather than transferring data directly from a database cursor to a user-defined object. Core elements may not be visible in a very simple ORM-centric application. However, as the Core is carefully integrated into the ORM to allow fluid transition between ORM and Core constructs, a more complex ORM-centric application can "move down" a level or two in order to deal with the database in a more specific and finely tuned manner, as the situation requires. As SQLAlchemy has matured, the Core API has become less explicit in regular use as the ORM continues to provide more sophisticated and comprehensive patterns. However, the availability of the Core was also a contributor to SQLAlchemy's early success, as it allowed early users to accomplish much more than would have been possible when the ORM was still being developed. The downside to the ORM/Core approach is that instructions must travel through more steps. Python's traditional C implementation has a significant overhead penalty for individual function calls, which are the primary cause of slowness in the runtime. Traditional methods of ameliorating this include shortening call chains through rearrangement and inlining, and replacing performance-critical areas with C code. SQLAlchemy has spent many years using both of these methods to improve performance. However, the growing acceptance of the PyPy interpreter for Python may promise to squash the remaining performance problems without the need to replace the majority of SQLAlchemy's internals with C code, as PyPy vastly reduces the impact of long call chains through just-in-time inlining and compilation. 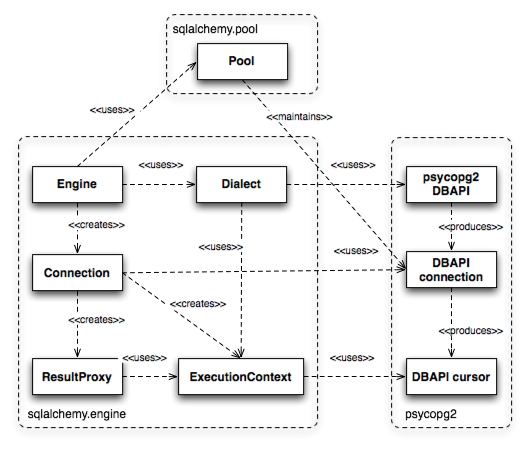 At the base of SQLAlchemy is a system for interacting with the database via the DBAPI. The DBAPI itself is not an actual library, only a specification. Therefore, implementations of the DBAPI are available for a particular target database, such as MySQL or PostgreSQL, or alternatively for particular non-DBAPI database adapters, such as ODBC and JDBC. The DBAPI presents two challenges. The first is to provide an easy-to-use yet full-featured facade around the DBAPI's rudimentary usage patterns. The second is to handle the extremely variable nature of specific DBAPI implementations as well as the underlying database engines. SQLAlchemy creates a facade around the classical DBAPI conversation. The point of entry to this facade is the create_engine call, from which connection and configuration information is assembled. An instance of Engine is produced as the result. This object then represents the gateway to the DBAPI, which itself is never exposed directly. The result returned by the execute method of Engine or Connection is called a ResultProxy, which offers an interface similar to the DBAPI cursor but with richer behavior. The Engine, Connection, and ResultProxy correspond to the DBAPI module, an instance of a specific DBAPI connection, and an instance of a specific DBAPI cursor, respectively. Behind the scenes, the Engine references an object called a Dialect. The Dialect is an abstract class for which many implementations exist, each one targeted at a specific DBAPI/database combination. A Connection created on behalf of the Engine will refer to this Dialect for all decisions, which may have varied behaviors depending on the target DBAPI and database in use. The Connection, when created, will procure and maintain an actual DBAPI connection from a repository known as a Pool that's also associated with the Engine. The Pool is responsible for creating new DBAPI connections and, usually, maintaining them in an in-memory pool for frequent re-use. During a statement execution, an additional object called an ExecutionContext is created by the Connection. The object lasts from the point of execution throughout the lifespan of the ResultProxy. It may also be available as a specific subclass for some DBAPI/database combinations. Figure 20.2 illustrates all of these objects and their relationships to each other as well as to the DBAPI components. For the task of managing variability in DBAPI behavior, first we'll consider the scope of the problem. The DBAPI specification, currently at version two, is written as a series of API definitions which allow for a wide degree of variability in behavior, and leave a good number of areas undefined. As a result, real-life DBAPIs exhibit a great degree of variability in several areas, including when Python unicode strings are acceptable and when they are not; how the "last inserted id"—that is, an autogenerated primary key—may be acquired after an INSERT statement; and how bound parameter values may be specified and interpreted. They also have a large number of idiosyncratic type-oriented behaviors, including the handling of binary, precision numeric, date, Boolean, and unicode data. 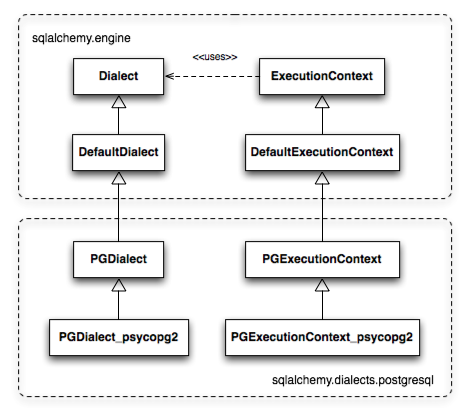 SQLAlchemy approaches this by allowing variability in both Dialect and ExecutionContext via multi-level subclassing. Figure 20.3 illustrates the relationship between Dialect and ExecutionContext when used with the psycopg2 dialect. The PGDialect class provides behaviors that are specific to the usage of the PostgreSQL database, such as the ARRAY datatype and schema catalogs; the PGDialect_psycopg2 class then provides behaviors specific to the psycopg2 DBAPI, including unicode data handlers and server-side cursor behavior. A variant on the above pattern presents itself when dealing with a DBAPI that supports multiple databases. Examples of this include pyodbc, which deals with any number of database backends via ODBC, and zxjdbc, a Jython-only driver which deals with JDBC. The above relationship is augmented by the use of a mixin class from the sqlalchemy.connectors package which provides DBAPI behavior that is common to multiple backends. 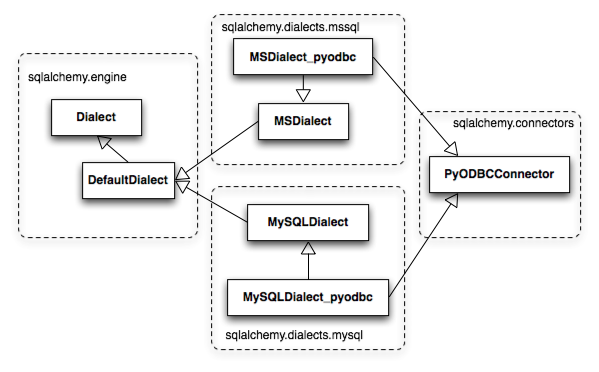 Figure 20.4 illustrates the common functionality of sqlalchemy.connectors.pyodbc shared among pyodbc-specific dialects for MySQL and Microsoft SQL Server. The Dialect and ExecutionContext objects provide a means to define every interaction with the database and DBAPI, including how connection arguments are formatted and how special quirks during statement execution are handled. The Dialect is also a factory for SQL compilation constructs that render SQL correctly for the target database, and type objects which define how Python data should be marshaled to and from the target DBAPI and database. With database connectivity and interactivity established, the next task is to provide for the creation and manipulation of backend-agnostic SQL statements. To achieve this, we need to define first how we will refer to the tables and columns present in a database—the so-called "schema". Tables and columns represent how data is organized, and most SQL statements consist of expressions and commands referring to these structures. An ORM or data access layer needs to provide programmatic access to the SQL language; at the base is a programmatic system of describing tables and columns. This is where SQLAlchemy offers the first strong division of Core and ORM, by offering the Table and Column constructs that describe the structure of the database independently of a user's model class definition. The rationale behind the division of schema definition from object relational mapping is that the relational schema can be designed unambiguously in terms of the relational database, including platform-specific details if necessary, without being muddled by object-relational concepts—these remain a separate concern. Being independent of the ORM component also means the schema description system is just as useful for any other kind of object-relational system which may be built on the Core. The Table and Column model falls under the scope of what's referred to as metadata, offering a collection object called MetaData to represent a collection of Table objects. The structure is derived mostly from Martin Fowler's description of "Metadata Mapping" in Patterns of Enterprise Application Architecture. Figure 20.5 illustrates some key elements of the sqlalchemy.schema package. Table represents the name and other attributes of an actual table present in a target schema. Its collection of Column objects represents naming and typing information about individual table columns. A full array of objects describing constraints, indexes, and sequences is provided to fill in many more details, some of which impact the behavior of the engine and SQL construction system. In particular, ForeignKeyConstraint is central to determining how two tables should be joined. 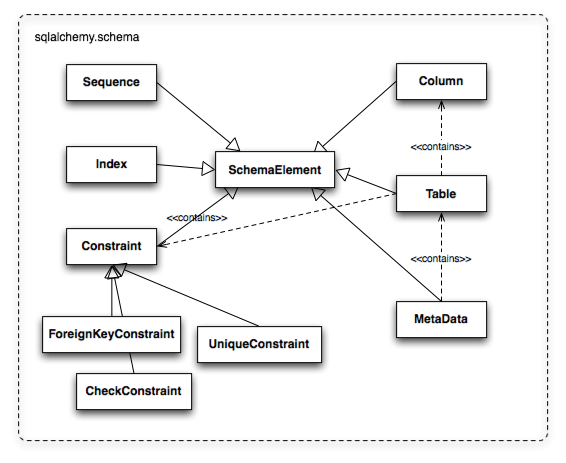 Table and Column in the schema package are unique versus the rest of the package in that they are dual-inheriting, both from the sqlalchemy.schema package and the sqlalchemy.sql.expression package, serving not just as schema-level constructs, but also as core syntactical units in the SQL expression language. This relationship is illustrated in Figure 20.6. In Figure 20.6 we can see that Table and Column inherit from the SQL world as specific forms of "things you can select from", known as a FromClause, and "things you can use in a SQL expression", known as a ColumnElement. 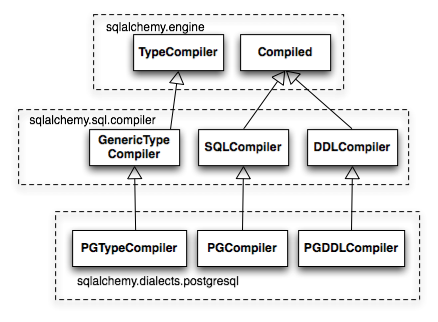 During SQLAlchemy's creation, the approach to SQL generation wasn't clear. A textual language might have been a likely candidate; this is a common approach which is at the core of well-known object-relational tools like Hibernate's HQL. For Python, however, a more intriguing choice was available: using Python objects and expressions to generatively construct expression tree structures, even re-purposing Python operators so that operators could be given SQL statement behavior. While it may not have been the first tool to do so, full credit goes to the SQLBuilder library included in Ian Bicking's SQLObject as the inspiration for the system of Python objects and operators used by SQLAlchemy's expression language. In this approach, Python objects represent lexical portions of a SQL expression. Methods on those objects, as well as overloaded operators, generate new lexical constructs derived from them. The most common object is the "Column" object—SQLObject would represent these on an ORM-mapped class using a namespace accessed via the .q attribute; SQLAlchemy named the attribute .c. The .c attribute remains today on Core selectable elements, such as those representing tables and select statements. A SQLAlchemy SQL expression construct is very much the kind of structure you'd create if you were parsing a SQL statement—it's a parse tree, except the developer creates the parse tree directly, rather than deriving it from a string. The core type of node in this parse tree is called ClauseElement, and Figure 20.7 illustrates the relationship of ClauseElement to some key classes. SELECT id FROM user WHERE name = ? The structure of the above select construct is shown in Figure 20.8. Note the representation of the literal value 'ed' is contained within the _BindParam construct, thus causing it to be rendered as a bound parameter marker in the SQL string using a question mark. From the tree diagram, one can see that a simple descending traversal through the nodes can quickly create a rendered SQL statement, as we'll see in greater detail in the section on statement compilation. The eq construct is actually a function originating from the Python operator built-in. Representing operators as an object (i.e., operator.eq) rather than a string (i.e., =) allows the string representation to be defined at statement compilation time, when database dialect information is known. 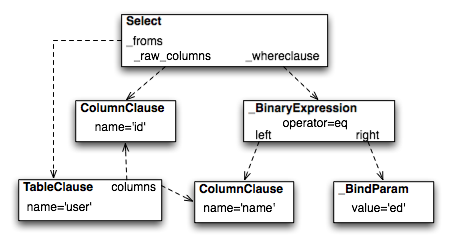 The central class responsible for rendering SQL expression trees into textual SQL is the Compiled class. This class has two primary subclasses, SQLCompiler and DDLCompiler. SQLCompiler handles SQL rendering operations for SELECT, INSERT, UPDATE, and DELETE statements, collectively classified as DQL (data query language) and DML (data manipulation language), while DDLCompiler handles various CREATE and DROP statements, classified as DDL (data definition language). There is an additional class hierarchy focused around string representations of types, starting at TypeCompiler. Individual dialects then provide their own subclasses of all three compiler types to define SQL language aspects specific to the target database. Figure 20.9 provides an overview of this class hierarchy with respect to the PostgreSQL dialect. The Compiled subclasses define a series of visit methods, each one referred to by a particular subclass of ClauseElement. A hierarchy of ClauseElement nodes is walked and a statement is constructed by recursively concatenating the string output of each visit function. As this proceeds, the Compiled object maintains state regarding anonymous identifier names, bound parameter names, and nesting of subqueries, among other things, all of which aim for the production of a string SQL statement as well as a final collection of bound parameters with default values. Figure 20.10 illustrates the process of visit methods resulting in textual units. A completed Compiled structure contains the full SQL string and collection of bound values. These are coerced by an ExecutionContext into the format expected by the DBAPI's execute method, which includes such considerations as the treatment of a unicode statement object, the type of collection used to store bound values, as well as specifics on how the bound values themselves should be coerced into representations appropriate to the DBAPI and target database. We now shift our attention to the ORM. The first goal is to use the system of table metadata we've defined to allow mapping of a user-defined class to a collection of columns in a database table. The second goal is to allow the definition of relationships between user-defined classes, based on relationships between tables in a database. SQLAlchemy refers to this as "mapping", following the well known Data Mapper pattern described in Fowler's Patterns of Enterprise Architecture. Overall, the SQLAlchemy ORM draws heavily from the practices detailed by Fowler. It's also heavily influenced by the famous Java relational mapper Hibernate and Ian Bicking's SQLObject product for Python. mapper can also affix other kinds of attributes to the class, including attributes which correspond to references to other kinds of objects, as well as arbitrary SQL expressions. The process of affixing arbitrary attributes to a class is known in the Python world as "monkeypatching"; however, since we are doing it in a data-driven and non-arbitrary way, the spirit of the operation is better expressed with the term class instrumentation. It may appear, above, that the class instrumentation is being achieved directly by our placement of id = Column(), but this is not the case. The Declarative extension uses a Python metaclass, which is a handy way to run a series of operations each time a new class is first declared, to generate a new Table object from what's been declared, and to pass it to the mapper function along with the class. The mapper function then does its job in exactly the same way, patching its own attributes onto the class, in this case towards the id attribute, and replacing what was there previously. By the time the metaclass initialization is complete (that is, when the flow of execution leaves the block delineated by User), the Column object marked by id has been moved into a new Table, and User.id has been replaced by a new attribute specific to the mapping. It was always intended that SQLAlchemy would have a shorthand, declarative form of configuration. However, the creation of Declarative was delayed in favor of continued work solidifying the mechanics of classical mapping. An interim extension called ActiveMapper, which later became the Elixir project, existed early on. It redefines mapping constructs in a higher-level declaration system. Declarative's goal was to reverse the direction of Elixir's heavily abstracted approach by establishing a system that preserved SQLAlchemy classical mapping concepts almost exactly, only reorganizing how they are used to be less verbose and more amenable to class-level extensions than a classical mapping would be. This change in attribute access proved to be a great improvement, as it allowed the column-like objects present on the class to gain additional class-specific capabilities not present on those originating directly from the underlying Table object. It also allowed usage integration between different kinds of class attributes, such as attributes which refer to table columns directly, attributes that refer to SQL expressions derived from those columns, and attributes that refer to a related class. Finally, it provided a symmetry between a mapped class, and an instance of that mapped class, in that the same attribute could take on different behavior depending on the type of parent. Class-bound attributes return SQL expressions while instance-bound attributes return actual data. When the mapping is complete, the structure of objects related to the class is detailed in Figure 20.11. The figure illustrates a SQLAlchemy mapping defined as two separate layers of interaction between the user-defined class and the table metadata to which it is mapped. Class instrumentation is pictured towards the left, while SQL and database functionality is pictured towards the right. The general pattern at play is that object composition is used to isolate behavioral roles, and object inheritance is used to distinguish amongst behavioral variances within a particular role. Within the realm of class instrumentation, the ClassManager is linked to the mapped class, while its collection of InstrumentedAttribute objects are linked to each attribute mapped on the class. InstrumentedAttribute is also the public-facing Python descriptor mentioned previously, and produces SQL expressions when used in a class-based expression (e.g., User.id==5). When dealing with an instance of User, InstrumentedAttribute delegates the behavior of the attribute to an AttributeImpl object, which is one of several varieties tailored towards the type of data being represented. 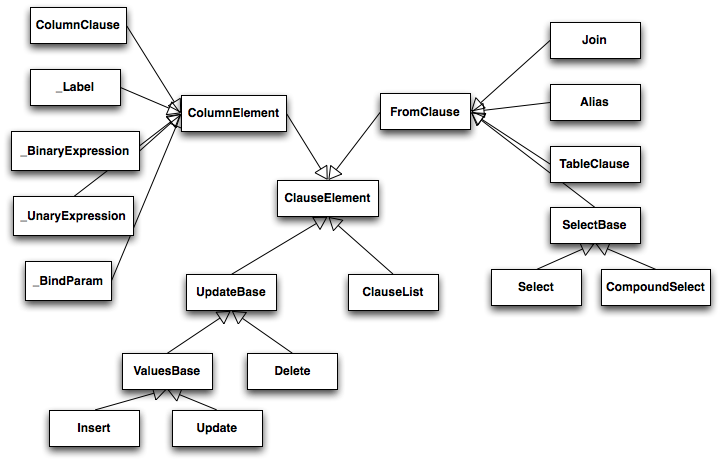 Towards the mapping side, the Mapper represents the linkage of a user-defined class and a selectable unit, most typically Table. Mapper maintains a collection of per-attribute objects known as MapperProperty, which deals with the SQL representation of a particular attribute. The most common variants of MapperProperty are ColumnProperty, representing a mapped column or SQL expression, and RelationshipProperty, representing a linkage to another mapper. MapperProperty delegates attribute loading behavior—including how the attribute renders in a SQL statement and how it is populated from a result row—to a LoaderStrategy object, of which there are several varieties. Different LoaderStrategies determine if the loading behavior of an attribute is deferred, eager, or immediate. A default version is chosen at mapper configuration time, with the option to use an alternate strategy at query time. RelationshipProperty also references a DependencyProcessor, which handles how inter-mapper dependencies and attribute synchronization should proceed at flush time. The choice of DependencyProcessor is based on the relational geometry of the parent and target selectables linked to the relationship. The Mapper/RelationshipProperty structure forms a graph, where Mapper objects are nodes and RelationshipProperty objects are directed edges. Once the full set of mappers have been declared by an application, a deferred "initialization" step known as the configuration proceeds. It is used mainly by each RelationshipProperty to solidify the details between its parent and target mappers, including choice of AttributeImpl as well as DependencyProcessor. This graph is a key data structure used throughout the operation of the ORM. It participates in operations such as the so-called "cascade" behavior that defines how operations should propagate along object paths, in query operations where related objects and collections are "eagerly" loaded at once, as well as on the object flushing side where a dependency graph of all objects is established before firing off a series of persistence steps. We create a Query that will yield instances of User, relative to a new Session we've created. Query provides a generative builder pattern in the same way as the select construct discussed previously, where additional criteria and modifiers are associated with a statement construct one method call at a time. When an iterative operation is called on the Query, it constructs a SQL expression construct representing a SELECT, emits it to the database, and then interprets the result set rows as ORM-oriented results corresponding to the initial set of entities being requested. Query makes a hard distinction between the SQL rendering and the data loading portions of the operation. The former refers to the construction of a SELECT statement, the latter to the interpretation of SQL result rows into ORM-mapped constructs. Data loading can, in fact, proceed without a SQL rendering step, as the Query may be asked to interpret results from a textual query hand-composed by the user. 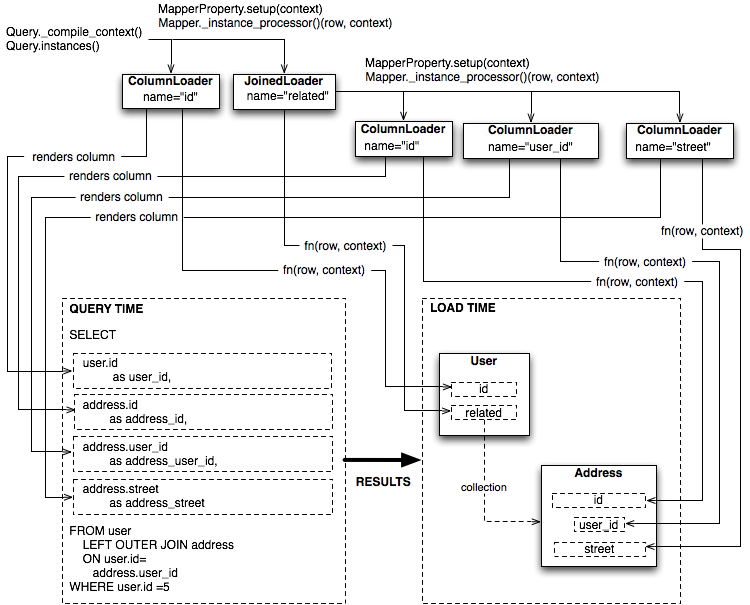 Both SQL rendering and data loading utilize a recursive descent through the graph formed by the series of lead Mapper objects, considering each column- or SQL-expression-holding ColumnProperty as a leaf node and each RelationshipProperty which is to be included in the query via a so-called "eager-load" as an edge leading to another Mapper node. The traversal and action to take at each node is ultimately the job of each LoaderStrategy associated with every MapperProperty, adding columns and joins to the SELECT statement being built in the SQL rendering phase, and producing Python functions that process result rows in the data loading phase. The Python functions produced in the data loading phase each receive a database row as they are fetched, and produce a possible change in the state of a mapped attribute in memory as a result. They are produced for a particular attribute conditionally, based on examination of the first incoming row in the result set, as well as on loading options. If a load of the attribute is not to proceed, no callable function is produced. Figure 20.12 illustrates the traversal of several LoaderStrategy objects in a joined eager loading scenario, illustrating their connection to a rendered SQL statement which occurs during the _compile_context method of Query. It also shows generation of row population functions which receive result rows and populate individual object attributes, a process which occurs within the instances method of Query. SQLAlchemy's early approach to populating results used a traditional traversal of fixed object methods associated with each strategy to receive each row and act accordingly. The loader callable system, first introduced in version 0.5, represented a dramatic leap in performance, as many decisions regarding row handling could be made just once up front instead of for each row, and a significant number of function calls with no net effect could be eliminated. In SQLAlchemy, the Session object presents the public interface for the actual usage of the ORM—that is, loading and persisting data. It provides the starting point for queries and persistence operations for a given database connection. The Session, in addition to serving as the gateway for database connectivity, maintains an active reference to the set of all mapped entities which are present in memory relative to that Session. It's in this way that the Session implements a facade for the identity map and unit of work patterns, both identified by Fowler. The identity map maintains a database-identity-unique mapping of all objects for a particular Session, eliminating the problems introduced by duplicate identities. The unit of work builds on the identity map to provide a system of automating the process of persisting all changes in state to the database in the most effective manner possible. The actual persistence step is known as a "flush", and in modern SQLAlchemy this step is usually automatic. The Session started out as a mostly concealed system responsible for the single task of emitting a flush. The flush process involves emitting SQL statements to the database, corresponding to changes in the state of objects tracked by the unit of work system and thereby synchronizing the current state of the database with what's in memory. The flush has always been one of the most complex operations performed by SQLAlchemy. The invocation of flush started out in very early versions behind a method called commit, and it was a method present on an implicit, thread-local object called objectstore. When one used SQLAlchemy 0.1, there was no need to call Session.add, nor was there any concept of an explicit Session at all. The only user-facing steps were to create mappers, create new objects, modify existing objects loaded through queries (where the queries themselves were invoked directly from each Mapper object), and then persist all changes via the objectstore.commit command. The pool of objects for a set of operations was unconditionally module-global and unconditionally thread-local. The objectstore.commit model was an immediate hit with the first group of users, but the rigidity of this model quickly ran into a wall. Users new to modern SQLAlchemy sometimes lament the need to define a factory, and possibly a registry, for Session objects, as well as the need to keep their objects organized into just one Session at a time, but this is far preferable to the early days when the entire system was completely implicit. The convenience of the 0.1 usage pattern is still largely present in modern SQLAlchemy, which features a session registry normally configured to use thread local scoping. The Session itself was only introduced in version 0.2 of SQLAlchemy, modeled loosely after the Session object present in Hibernate. This version featured integrated transactional control, where the Session could be placed into a transaction via the begin method, and completed via the commit method. The objectstore.commit method was renamed to objectstore.flush, and new Session objects could be created at any time. The Session itself was broken off from another object called UnitOfWork, which remains as a private object responsible for executing the actual flush operation. While the flush process started as a method explicitly invoked by the user, the 0.4 series of SQLAlchemy introduced the concept of autoflush, which meant that a flush was emitted immediately before each query. The advantage of autoflush is that the SQL statement emitted by a query always has access on the relational side to the exact state that is present in memory, as all changes have been sent over. Early versions of SQLAlchemy couldn't include this feature, because the most common pattern of usage was that the flush statement would also commit the changes permanently. But when autoflush was introduced, it was accompanied by another feature called the transactional Session, which provided a Session that would start out automatically in a transaction that remained until the user called commit explicitly. With the introduction of this feature, the flush method no longer committed the data that it flushed, and could safely be called on an automated basis. The Session could now provide a step-by-step synchronization between in-memory state and SQL query state by flushing as needed, with nothing permanently persisted until the explicit commit step. This behavior is, in fact, exactly the same in Hibernate for Java. However, SQLAlchemy embraced this style of usage based on the same behavior in the Storm ORM for Python, introduced when SQLAlchemy was in version 0.3. Version 0.5 brought more transaction integration when post-transaction expiration was introduced; after each commit or rollback, by default all states within the Session are expired (erased), to be populated again when subsequent SQL statements re-select the data, or when the attributes on the remaining set of expired objects are accessed in the context of the new transaction. Originally, SQLAlchemy was constructed around the assumption that SELECT statements should be emitted as little as possible, unconditionally. The expire-on-commit behavior was slow in coming for this reason; however, it entirely solved the issue of the Session which contained stale data post-transaction with no simple way to load newer data without rebuilding the full set of objects already loaded. Early on, it seemed that this problem couldn't be reasonably solved, as it wasn't apparent when the Session should consider the current state to be stale, and thus produce an expensive new set of SELECT statements on the next access. However, once the Session moved to an always-in-a-transaction model, the point of transaction end became apparent as the natural point of data expiration, as the nature of a transaction with a high degree of isolation is that it cannot see new data until it's committed or rolled back anyway. Different databases and configurations, of course, have varied degrees of transaction isolation, including no transactions at all. These modes of usage are entirely acceptable with SQLAlchemy's expiration model; the developer only needs to be aware that a lower isolation level may expose un-isolated changes within a Session if multiple Sessions share the same rows. This is not at all different from what can occur when using two database connections directly. Figure 20.13 illustrates a Session and the primary structures it deals with. The public-facing portions above are the Session itself and the collection of user objects, each of which is an instance of a mapped class. Here we see that mapped objects keep a reference to a SQLAlchemy construct called InstanceState, which tracks ORM state for an individual instance including pending attribute changes and attribute expiration status. InstanceState is the instance-level side of the attribute instrumentation discussed in the preceding section, Anatomy of a Mapping, corresponding to the ClassManager at the class level, and maintaining the state of the mapped object's dictionary (i.e., the Python __dict__ attribute) on behalf of the AttributeImpl objects associated with the class. 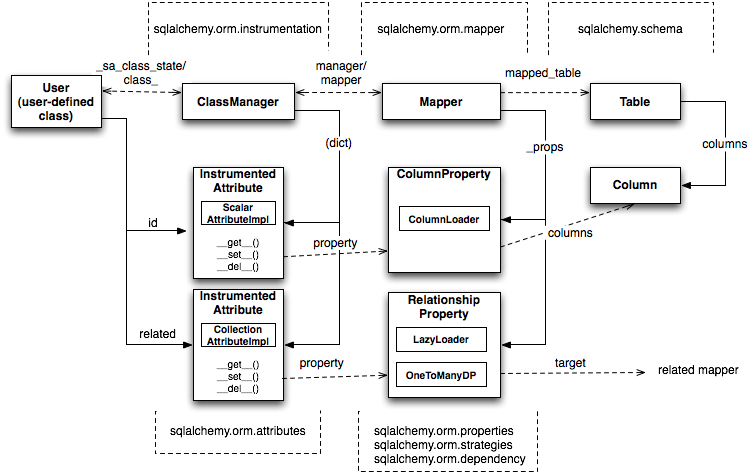 The IdentityMap is a mapping of database identities to InstanceState objects, for those objects which have a database identity, which are referred to as persistent. The default implementation of IdentityMap works with InstanceState to self-manage its size by removing user-mapped instances once all strong references to them have been removed—in this way it works in the same way as Python's WeakValueDictionary. The Session protects the set of all objects marked as dirty or deleted, as well as pending objects marked new, from garbage collection, by creating strong references to those objects with pending changes. All strong references are then discarded after the flush. InstanceState also performs the critical task of maintaining "what's changed" for the attributes of a particular object, using a move-on-change system that stores the "previous" value of a particular attribute in a dictionary called committed_state before assigning the incoming value to the object's current dictionary. At flush time, the contents of committed_state and the __dict__ associated with the object are compared to produce the set of net changes on each object. In the case of collections, a separate collections package coordinates with the InstrumentedAttribute/InstanceState system to maintain a collection of net changes to a particular mapped collection of objects. Common Python classes such as set, list and dict are subclassed before use and augmented with history-tracking mutator methods. The collection system was reworked in 0.4 to be open ended and usable for any collection-like object. Session, in its default state of usage, maintains an open transaction for all operations which is completed when commit or rollback is called. The SessionTransaction maintains a set of zero or more Connection objects, each representing an open transaction on a particular database. SessionTransaction is a lazy-initializing object that begins with no database state present. As a particular backend is required to participate in a statement execution, a Connection corresponding to that database is added to SessionTransaction's list of connections. While a single connection at a time is common, the multiple connection scenario is supported where the specific connection used for a particular operation is determined based on configurations associated with the Table, Mapper, or SQL construct itself involved in the operation. Multiple connections can also coordinate the transaction using two-phase behavior, for those DBAPIs which provide it. The flush method provided by Session turns over its work to a separate module called unitofwork. As mentioned earlier, the flush process is probably the most complex function of SQLAlchemy. The job of the unit of work is to move all of the pending state present in a particular Session out to the database, emptying out the new, dirty, and deleted collections maintained by the Session. Once completed, the in-memory state of the Session and what's present in the current transaction match. The primary challenge is to determine the correct series of persistence steps, and then to perform them in the correct order. This includes determining the list of INSERT, UPDATE, and DELETE statements, including those resulting from the cascade of a related row being deleted or otherwise moved; ensuring that UPDATE statements contain only those columns which were actually modified; establishing "synchronization" operations that will copy the state of primary key columns over to referencing foreign key columns, at the point at which newly generated primary key identifiers are available; ensuring that INSERTs occur in the order in which objects were added to the Session and as efficiently as possible; and ensuring that UPDATE and DELETE statements occur within a deterministic ordering so as to reduce the chance of deadlocks. The unit of work implementation began as a tangled system of structures that was written in an ad hoc way; its development can be compared to finding the way out of a forest without a map. Early bugs and missing behaviors were solved with bolted-on fixes, and while several refactorings improved matters through version 0.5, it was not until version 0.6 that the unit of work—by that time stable, well-understood, and covered by hundreds of tests—could be rewritten entirely from scratch. After many weeks of considering a new approach that would be driven by consistent data structures, the process of rewriting it to use this new model took only a few days, as the idea was by this time well understood. It was also greatly helped by the fact that the new implementation's behavior could be carefully cross-checked against the existing version. This process shows how the first iteration of something, however awful, is still valuable as long as it provides a working model. It further shows how total rewrites of a subsystem is often not only appropriate, but an integral part of development for hard-to-develop systems. The key paradigm behind the unit of work is that of assembling the full list of actions to be taken into a data structure, with each node representing a single step; this is known in design patterns parlance as the command pattern. The series of "commands" within this structure is then organized into a specific ordering using a topological sort. 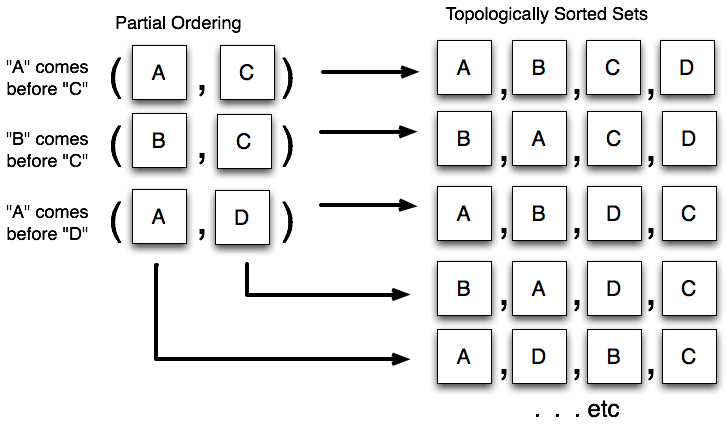 A topological sort is a process that sorts items based on a partial ordering, that is, only certain elements must precede others. Figure 20.14 illustrates the behavior of the topological sort. The unit of work constructs a partial ordering based on those persistence commands which must precede others. The commands are then topologically sorted and invoked in order. The determination of which commands precede which is derived primarily from the presence of a relationship that bridges two Mapper objects—generally, one Mapper is considered to be dependent on the other, as the relationship implies that one Mapper has a foreign key dependency on the other. Similar rules exist for many-to-many association tables, but here we focus on the case of one-to-many/many-to-one relationships. Foreign key dependencies are resolved in order to prevent constraint violations from occurring, with no reliance on needing to mark constraints as "deferred". But just as importantly, the ordering allows primary key identifiers, which on many platforms are only generated when an INSERT actually occurs, to be populated from a just-executed INSERT statement's result into the parameter list of a dependent row that's about to be inserted. For deletes, the same ordering is used in reverse—dependent rows are deleted before those on which they depend, as these rows cannot be present without the referent of their foreign key being present. The unit of work features a system where the topological sort is performed at two different levels, based on the structure of dependencies present. The first level organizes persistence steps into buckets based on the dependencies between mappers, that is, full "buckets" of objects corresponding to a particular class. The second level breaks up zero or more of these "buckets" into smaller batches, to handle the case of reference cycles or self-referring tables. 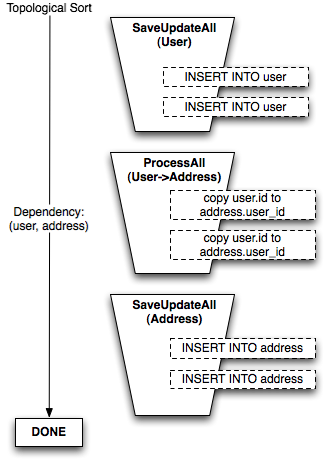 Figure 20.15 illustrates the "buckets" generated to insert a set of User objects, then a set of Address objects, where an intermediary step copies newly generated User primary key values into the user_id foreign key column of each Address object. In the per-mapper sorting situation, any number of User and Address objects can be flushed with no impact on the complexity of steps or how many "dependencies" must be considered. The second level of sorting organizes persistence steps based on direct dependencies between individual objects within the scope of a single mapper. The simplest example of when this occurs is a table which contains a foreign key constraint to itself; a particular row in the table needs to be inserted before another row in the same table which refers to it. Another is when a series of tables have a reference cycle: table A references table B, which references table C, that then references table A. Some A objects must be inserted before others so as to allow the B and C objects to also be inserted. The table that refers to itself is a special case of reference cycle. To determine which operations can remain in their aggregated, per-Mapper buckets, and which will be broken into a larger set of per-object commands, a cycle detection algorithm is applied to the set of dependencies that exist between mappers, using a modified version of a cycle detection algorithm found on Guido Van Rossum's blog. Those buckets involved in cycles are are then broken up into per-object operations and mixed into the collection of per-mapper buckets through the addition of new dependency rules from the per-object buckets back to the per-mapper buckets. 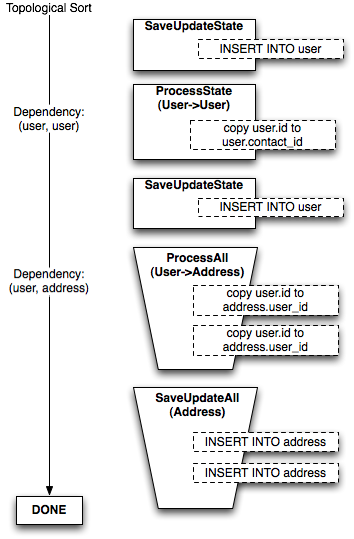 Figure 20.16 illustrates the bucket of User objects being broken up into individual per-object commands, resulting from the addition of a new relationship from User to itself called contact. The rationale behind the bucket structure is that it allows batching of common statements as much as possible, both reducing the number of steps required in Python and making possible more efficient interactions with the DBAPI, which can sometimes execute thousands of statements within a single Python method call. Only when a reference cycle exists between mappers does the more expensive per-object-dependency pattern kick in, and even then it only occurs for those portions of the object graph which require it. SQLAlchemy has aimed very high since its inception, with the goal of being the most feature-rich and versatile database product possible. It has done so while maintaining its focus on relational databases, recognizing that supporting the usefulness of relational databases in a deep and comprehensive way is a major undertaking; and even now, the scope of the undertaking continues to reveal itself as larger than previously perceived. The component-based approach is intended to extract the most value possible from each area of functionality, providing many different units that applications can use alone or in combination. This system has been challenging to create, maintain, and deliver. The development course was intended to be slow, based on the theory that a methodical, broad-based construction of solid functionality is ultimately more valuable than fast delivery of features without foundation. It has taken a long time for SQLAlchemy to construct a consistent and well-documented user story, but throughout the process, the underlying architecture was always a step ahead, leading in some cases to the "time machine" effect where features can be added almost before users request them. The Python language has been a reliable host (if a little finicky, particularly in the area of performance). The language's consistency and tremendously open run-time model has allowed SQLAlchemy to provide a nicer experience than that offered by similar products written in other languages. It is the hope of the SQLAlchemy project that Python gain ever-deeper acceptance into as wide a variety of fields and industries as possible, and that the use of relational databases remains vibrant and progressive. The goal of SQLAlchemy is to demonstrate that relational databases, Python, and well-considered object models are all very much worthwhile development tools.